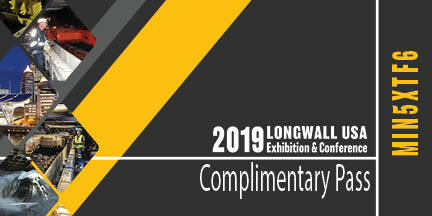 The First 200 readers who sign up will receive a complimentary pass to LongwallUSA 2019. The complimentary pass is not valid at the door or time of show. The complimentary pass allows access to the conference floor. The complimentary pass does not guarantee access to post-conference materials. The complimentary pass recipient or user will not receive credit for professional development hours (PDHs). To receive PDHs, users must purchase a full-conference registration. Mining Media International Inc. reserves the right to revoke any complimentary pass for any reason.